I know, it seems like I've abandoned this series on Bombay street food. I haven't, but sometimes theres just so much going on that its not possible to fit everything into a twenty four hour day. In the past few days since I've returned, the day seems to have somehow shrunk and become even shorter. Anyway, the news is that I'm going to try and squeeze in some time for this serious. South Indian fare is very popular street food in Bombay. Today, I've got a little twist on the the traditional fare, but I promise you it is good, so very good. Typically, South Indian snacks like dosas and idlis take a while to make. The batter is made with a base combination of rice and urad dal (black gram). The ingredients have to be soaked, ground and fermented etc. (not necessarily in that order). In time, I'm itching to try out the traditional method. This take, however, is a quicker, simpler version. Its almost an instant recipe. The idlis turn out really delicious and I made a quick coconut chutney that my mum always made to go along with dosas and idlis. My mum has this amazing lady for a neighbor. She is from South India and ever so often whenever she has time away from school, where she's a full time teacher, assistant head mistress and I don't know what else, she'd treat us to a huge portion of breakfast snacks like this that she'd make for her family. I miss those days. And honestly, she was the first person I thought about while I was eating these. I should try and coax her to give me her recipe for the traditional rava idli. But back to the instant rava idlis, they make a quick healthy snack with rava (semolina) and it is steamed. What could be healthier? For me, this is like soul food. Mix all the ingredients in a large bowl and make sure there are no lumps. Let it stand for 20-30 minutes. During this time you can make the chutney (Recipe below). 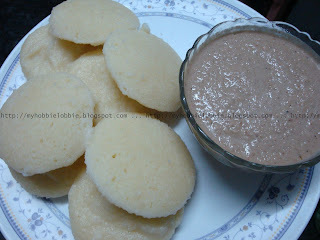 Pour the batter into idli moulds and steam for about 10 minutes. Open the steamer and let it cool for a couple of minutes. Then take the idlis out of the moulds. A small spatula or the blunt end of a knife should be just right incase you need to help the out of the moulds. Enjoy them hot with some Coconut Chutney. Blitz all the ingredients together in a blender. Taste and adjust seasoning. And thats it. In half an hour you can treat yourself to something yummy and wholesome. Definitely a new recipe for me. I'm slightly embarrassed to say that I don't think I've even ever heard of rava or semoline. Going to have to check it out! Thanks for linking up on Recipes I Can't Wait to Try! I haven't heard about this street food Mumbai. looks delicious. I am not familiar with indian food, but coconut chutney sounds very interesting! so interesting! i agree about the time...it goes way too fast and there arent enough hours in the day :) thank you for sharing this recipe with tuesday night supper club. Trisha, you always expose me and my readers to new and wonderful things! Rava Idli would definitely be a new experience for my Western palette, but one that I have a hunch I'd enjoy, especially with that amazing Coconut Chutney! Thanks Jenn, I hope you enjoy it!!! Sounds really yummy. Thanks for sharing the recipe. I will surely try this out. Thanks for stopping by Lisa!!! What an interesting post! I had never heard of Rava Idli before but they sound delicious. I especially like the sound of the coconut chutney. Thank you for sharing this post with Let's Do Brunch! Hope to see you again soon! its ssoooo easy, i made it but problem is it doesnt came out good what to do?its taste good but it doesnt fluff well what il be the reason? Maybe you need to steam it for a little longer, that happens if its not fully cooked. Also, once it is cooked, let it stand for a little while before you take it out. I had to use a small knife to loosen the edges first and then they came right out. I hope you have better luck next time. I tried your babata vada recipe it was very very simple and tastes very good . Thanks for the recipe.